Our Mission & Our Vision | Strouse - More than Tape. The Strouse Corporation provides unsurpassed design and manufacture of innovative, engineered adhesive solutions for sophisticated, design-focused customers globally. The Strouse Corporation is a leader in the custom adhesive solutions industry through strategic investment in sophisticated technology and creative, skilled employees that provide solutions to enable customer growth in global markets. Sue Chambers is the company President and CEO. She has extensive experience in the industry and business relationships all over the globe. 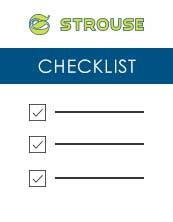 Strouse has been certified as a Women’s Business Enterprise since 2005. Founded in 1986, The Strouse Corporation specializes in the design and fabrication of pressure sensitive products that provide solutions to our customer's wide variety of applications. Located in Westminster, Maryland, Strouse has a history of success in designing applications for a wide range of companies, from electronics, automotive and appliance manufacturers to medical, consumer products and the U.S. military. Strouse is known for its innovation, experience, and expertise and has enjoyed steady growth through its strategic focus. Investment in new technologies has enabled the company to continually expand corporate capabilities and secure a worldwide reputation for technical expertise. Strouse is known for creating complex, multi-layered products requiring tight tolerances and providing parts via proficient production while maintaining the utmost in quality. The Strouse Corporation's quality management system has been certified the under ISO 9001:2008 standards and ISO 13485:2003 by SAI Global. Strouse is also an established 3M Preferred Converter and has a rich history of partnership with 3M. If you have a question about a project you are working on or think using pressure sensitive tape can bring your product to market faster, contact us today!